Ian Kurtz and Reese Salen deliver the bookwheel. Matt Nygren is a fifth-year mechanical engineering student who recently finished a unique multidisciplinary senior design project. 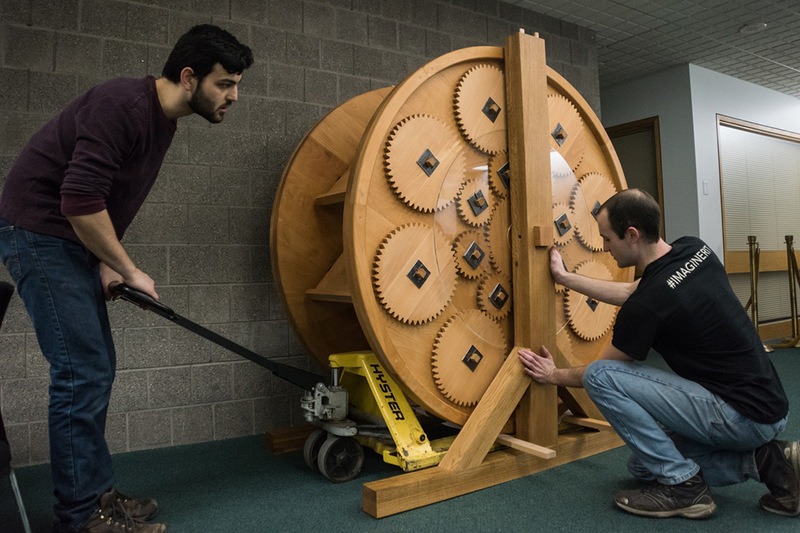 Nygren worked with three other fifth-year mechanical engineering students, Ian Kurtz ’18, Reese Salen ’18 and Maher Abdelkawi, to recreate a piece of 16th century technology: Ramelli’s Rotating Reader. Their two clients, Steven Galbraith from the Cary Archive at RIT and Anna Siebach-Larsen from the Hope Robbins Library at the University of Rochester, were looking for students to build two rotating readers to display at their respective institutions. To accomplish this, the team began working on the project during the spring of 2018 and continued through the summer and fall semester. With the help of associate professor Susan Farnand from the color science program, who served as a guide for the team and project; Will Tracey from the School for American Crafts at RIT; Professor Juilee Decker from the museum studies program; and Katharine MacLaren, a student from the museum studies program, Nygren and the rest of the bookwheel team were able to complete the project in early January and deliver the two bookwheels to the Cary Archive and the Hope Robbins Library. For more specific details about the design process, go to http://edge.rit.edu/edge/P18510/public/Home. Question: What is Ramelli’s Rotating Reader? Answer: In the 16th century, an Italian engineer, Agostino Ramelli, designed something called a bookwheel. It was basically a Ferris wheel for books that used a planetary gear system to keep all the shelves level as it turns. It allows someone to read eight different books at once and cross reference between them. The design is pretty ostentatious. Ramelli seemed to be showing off his knowledge of gearing. Question: Why were you initially interested in this project? Answer: It was mostly the hands-on aspect of it. Most of the other projects were all kind of prototype stuff. This seemed to be a fairly straightforward craftsmanship project. Question: What specific goals or deliverables did you have by the end of this project? Answer: The main deliverable was two functioning bookwheels, one for the Cary Archive on campus and another for the Hope Robbins Library at the University of Rochester. The bookwheels had to be attractive, functional and they had to be safe enough that people wouldn’t injure themselves while using it. Question: Did you enjoy your experience working with such unique clients? Answer: This project definitely wasn’t a typical engineering senior design project. To start off, since we were designing for an exhibition, one of the biggest requirements was appearance and historical accuracy. The relationship with our customers, Steven Galbraith and Anna Siebach-Larsen, was fantastic and we tended to be on the same page throughout the entire process. Question: Were there any roadblocks to your progress? Answer: The biggest roadblock was purchasing and shipping materials for the bookwheel. We bought somewhere between half and three quarters of a ton of wood, primarily European beech wood. Getting all of the wood paid for and shipped was an ordeal, and when we finally got the wood, we were missing part of the order. We didn’t finish by the end of the fall semester as we planned because we didn’t actually get all of our materials until two weeks before the end of the semester. However, Ian and Reese returned to RIT in January to finish building the frame and assembling the bookwheels. The engineering for the project is done, and now professor Juilee Decker and Katharine MacLaren will be working on the museum experience aspect of the project. Question: What has been the most exciting or interesting part about working on this project? Answer: Working with Will Tracey, a technician for School for American Crafts, was a fantastic experience. I cannot overstate how important he was to this project. Without his mentorship, the bookwheels probably would have never been finished. Question: In what ways do you think this experience will help you as you move forward as an engineer? Answer: This experience certainly has helped me understand more of the processes and techniques of building and manufacturing. Becoming more familiar with woodworking and the computer numeric control (CNC) tooling is going to help me design things that are better suited for the manufacturing process. I don’t know if my professional pursuits are going to involve much woodworking, but my personal pursuits certainly will.